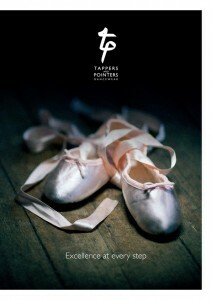 Dancewear firm, Tappers & Pointers, is underlining its British manufacturing values with a new campaign created by Clock Creative in Manchester. Aimed purely at the B2B market, the company’s new branding will roll out later this month. “In a fiercely competitive marketplace, often characterised by throwaway fashion, it was clear that Tappers & Pointers needed to celebrate their points of difference – namely an insistence on high quality products and a real focus on their B2B trade customers,” explained David Bailey, brand development manager at Clock Creative. The brand’s differentiation came about through its commitment to traditional craftspeople and quality British manufacturing. The photography was done by Phil Lane.